The clear: both from bb core is causing some headaches in the new theme with displaying post content, as they drop down to below the author section. 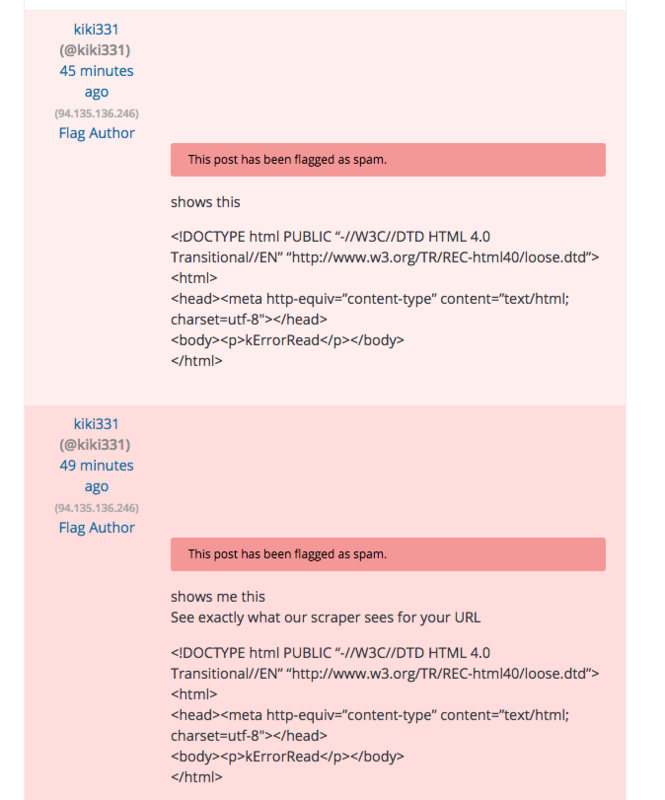 Applying a clear: none to .bbpress #bbpress-forums div.bbp-template-notice in ​https://wordpress.org/support/wp-content/themes/pub/wporg-support/sass/site/_bbpress.scss sorts out the pushing of notices. meta-2162.png​ (38.1 KB) - added by SergeyBiryukov 2 years ago. A screenshot would be helpful here. The border on the notice is also missing, and it's hard to see light orange on light pink. @mapk: Is that intentional? In the old theme, the notice was much more... noticeable :) See meta-2162.png​. 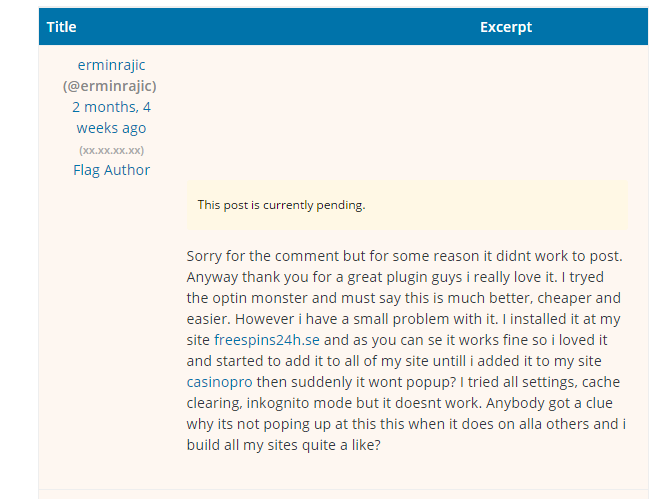 Overall, dropping the borders from the notifications is a design decision I was hoping to implement throughout the site (​http://codepen.io/mapk/pen/dpwmYw), but I didn't realize they showed up on top of the light pink forum replies. Can we drop the background of these replies since there's a notification? Isn't the notification enough to signify the status of this reply? 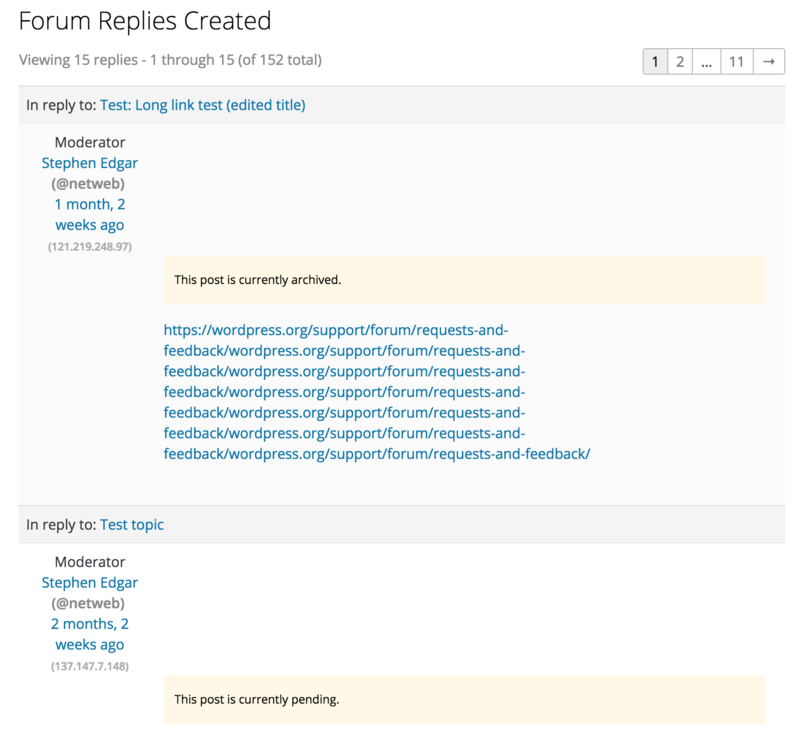 Also, I notice these replies don't follow the layout of the new forum replies. We should probably fix that. Maybe a new ticket? 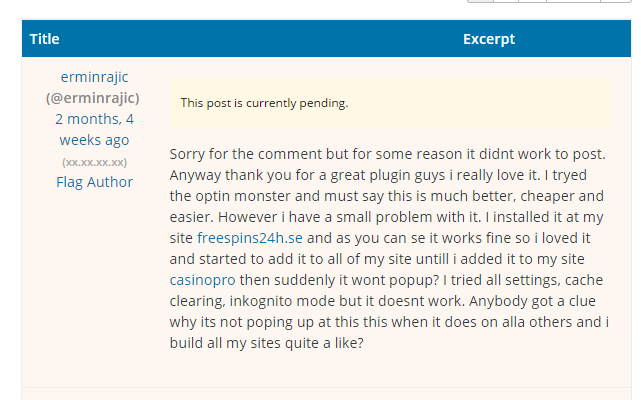 I also noticed the pending replies page needs a lot of work. I'd be more than happy to see the background colours go away, they reduce readability even for those with "normal" eyesight. 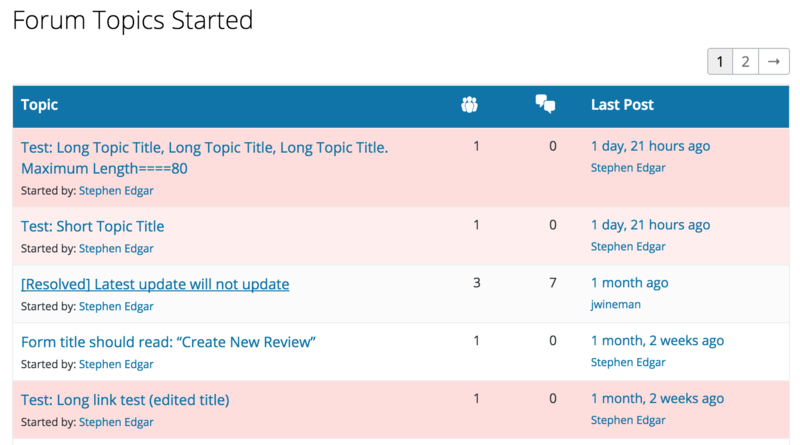 The purpose of the background colors based on post status which is "by design" in bbPress core is to make highlighting posts with a quick visual queue, i.e. the reddish #fdd for spam, and yellowish #fef7f1 for pending, and the w.org specific archived status also using #fdd. OK, I understand the argument for keeping the background colors. If this remains, we should look at adjusting the colors for the notifications within them. I imagine these super bright colors would only be used on the support forum section and not so much on the rest of the site. Any thoughts? The darker colours certainly improved readability while keeping the current expectations. The large gap was fixed in #2356, so let's just fix the colors here. 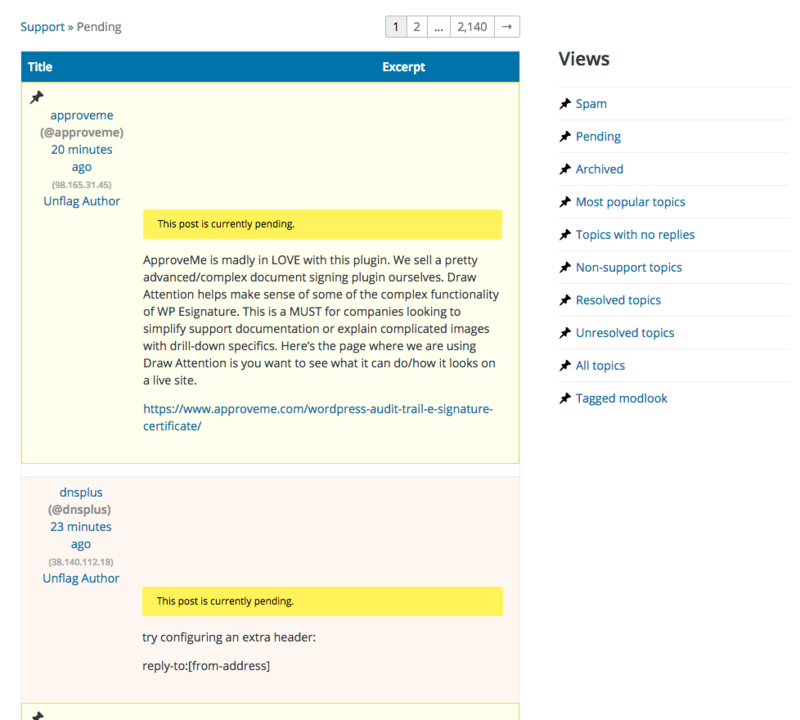 Support Theme: Adjust colors for notices indicating that a post is pending or has been flagged as spam.